Dellia Ihinger’s commute from Minneapolis to the Avalon School near University Avenue in St. Paul typically involves boarding a Route 16 or Route 50 bus. Next year, as she embarks on her senior year of high school, Ihinger hopes to add another leg to her trip, using Route 84 to reach Hamline University where she can take classes and earn early college credit. Ihinger was recently aboard a Route 84 bus on her way to an interview at Hamline, among a handful of schools that line Snelling Avenue – the main thoroughfare on the north-south route. “I’ve ridden the bus since I was little and now I’ll just take it a little further,” said Ihinger, who recently obtained a driver’s permit but doesn’t want to deal with parking or the expenses of a car. Ihinger is part of a growing Route 84 customer base that is driving transit enhancements and planning along the corridor, which extends nearly 10 miles from the METRO Blue Line’s 46th Street Station to the Rosedale Transit Center in Roseville largely along Ford Parkway and Snelling Avenue. The 84D also runs south on St. Paul Avenue to West 7th Street. To better connect with the METRO Green Line, opening in mid-2014, Route 84 trips will run every 10 minutes, all day long. Buses now run every 15 minutes. The schedule will also be adjusted so customers can board the Green Line at University and Snelling avenues with short wait times. Planning is also underway to build the region’s first Arterial Bus Rapid Transit (BRT) line on the Route 84 corridor. BRT plans call for light-rail-like features such as enhanced station areas, real-time transit information, pre-paid fare technology and vehicles with rear boarding areas. Buses would continue to run every ten minutes but end-to-end trips would take 27 percent less time as buses benefit from traffic advantages and speedier boardings. Route 84 buses would run every half hour and make more stops, providing customers local service. In 2012, Route 84 drew 1.3 million customers, with an average of nearly 4,000 daily weekday boardings. With BRT features, planners expect there could be an average of 8,700 daily customers in 2030. The coming improvements would serve as just the latest evolution for transit on Snelling Avenue. A streetcar line operated on the corridor between 1905 and 1952, providing all-day service every 10 minutes during peak periods. At its longest, the streetcar traveled from Highland Parkway to Hamline and Hoyt avenues, with extra service to the nearby Minnesota State Fairgrounds during the fair. In the early 1970s, the route was extended to Roseville’s Rosedale Center. In 2001, it was straightened north of Como Avenue to follow Snelling Avenue directly to Rosedale, where a transit center has been built in the northeast corner of the mall, near the entrance to the AMC Rosedale 14. 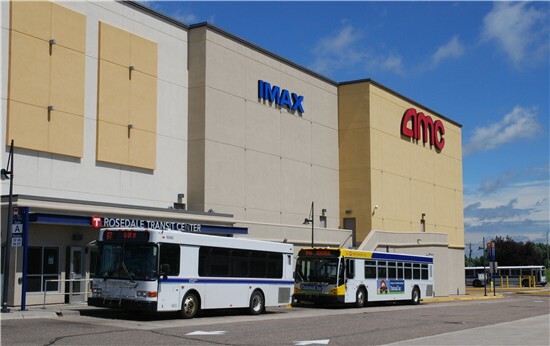 Route 84 served Mall of America and the Minneapolis-St. Paul International Airport until the METRO Blue Line opened in 2004. Customers traveling to those destinations now transfer to the Blue Line at the 46th Street Station, a bustling, multi-modal transit hub adjacent to a new mixed-use residential and commercial development: Oaks Station Place. Route 84 has several landmarks of its own, though. The corridor passes Minnehaha Park and provides service to a number of schools, including Highland Park High School, Macalester College and Hamline University. The University of Minnesota’s St. Paul Campus and St. Catherine's University are a short distance to the west of Snelling Avenue. Several shopping destinations also line the route, including Har Mar Mall, Midway Shopping Center, Grand Avenue, Sibley Plaza and Highland Park. Greg Stout, a 15-year Route 84 customer, lives in downtown St. Paul but said he frequently uses Route 84 to shop and get his hair cut in Highland Park. Stout said he enjoys Highland Park’s comparative calmness and the scenery he passes while on the bus. John Dillery, a senior planner at Metro Transit, said the evolution of transit on Snelling Avenue reflects a strong and growing rider base that will continue to expand with the opening of the Green Line and the coming BRT improvements. “It’s a really positive story of growth, taking the bus and sending it where people want to go, and doing it well,” he said. Service: Route 84 is part of Metro Transit's Hi-Frequency Network, with service at least every 15 minutes during peak periods. 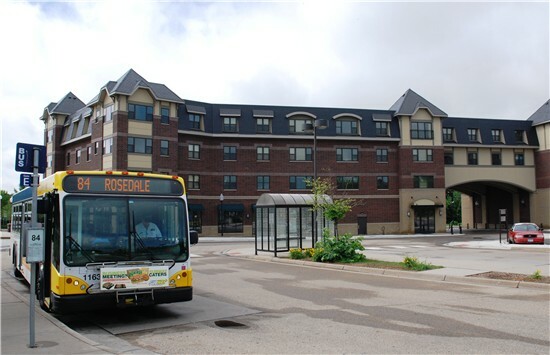 Buses travel between Rosedale Transit Center at Rosedale Center in Roseville and the METRO Blue Line’s 46th Street Station in Minneapolis. The route travels largely along Snelling Avenue, passing the University of Minnesota’s St. Paul Campus, Minnesota State Fairgrounds, Hamline University, University Avenue, where a new METRO Green Line station will open in 2014, and Macalester College. On the south end, Route 84 travels east-west, crossing the Mississippi River on Ford Parkway. A second branch goes south via St. Paul Avenue to West 7th Street at Sibley Plaza. Ridership: Nearly 1.3 million customers boarded Route 84 buses in 2012, with nearly 4,000 weekday boardings. By 2030, estimates project around 8,700 daily customers on the corridor. History: A streetcar operated on Snelling Avenue between 1905 and 1952, when it was replaced with bus service. Buses began traveling to Roseville with the opening of Rosedale Center in the early 1970s. Buses ran as far south as the Mall of America until the METRO Blue Line opened in 2004; MOA-bound customers now transfer to the Blue Line at the 46th Street Station. 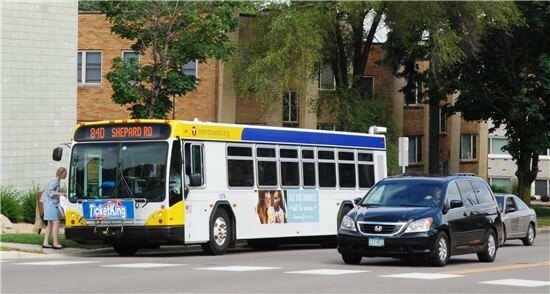 Future: Snelling Avenue has been identified as a top Arterial Bus Rapid Transit Corridor, where enhanced station areas, new vehicles and expanded service would combine to speed travel times and improve the customer experience.